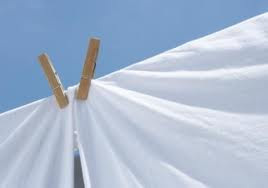 In England, washers are small -- tiny, really and some are combination washer/dryer but when I changed the sheets at our cottage in the Cotswolds, I found that it best to do a wash only cycle and hang them outside on the convenient clothesline. And when I brought them in . . . . oh, the fragrance -- the sunshine in those sheets. Heaven!!! I used to hang my sheets outside but then my knees got bad and it was easier to toss them in the dryer. And so I got used to sheets that smelled of Tide. The first night that we used the line dried sheets, all of the memories of that wonderful smell of the outdoors came back. 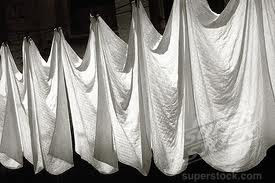 For when I grew up, we had a washer but no dryer and so all of our clothes were hung outside -- the sheets smelled heavenly as did the towels (but they get scratchy -- they're not soft and lovely like dryer towels). When my mother finally got a dryer, she often hung her sheets outside for she, like me, loved their outdoor fragrance. There is no real "clothesline" in the garden at Linderhof (nor is there room for one) -- but I do have a retracting clothesline that I bought years and years ago -- it hangs high on the fence and you hook it to the garden post. It's one line but it works for one set of sheets (or now a duvet cover, bottom sheet and two pillowcases). And there is some satisfaction in looking outside and seeing the sheets flapping in the wind. And just before dinner when you bring them in . . . . they smell heavenly! And if you store them in a cupboard with bags of lavender or lavender wands, their fragrance is heady -- the mix of sunshine and lavender is a great combination!!! Plus, you have the advantage of being "green" -- for you're not using energy to dry your clothes -- just the sunshine and wind! It's Wednesday and time to join Susan at A Southern Daydream for Outdoor Wednesday. Note: My clothesline spans the driveway and is in front of the garage -- does not make a pretty picture. I took the above pictures from the net -- from commercial sites. So those are not my sheets! There isn't anything better than scooting down between clean sheets that have been drying outside. They smell so good! As an early married couple I used to love the smell of sheets, clothes and especially diapers hung out on the clothsline. Most young couples today use disposable diapers now and my DD looks at me really funny when I ask her if she has some cloth diapers??? BTW, my lavender has never bloomed so well and the fragrance is pure heaven when I walk out onto our patio because I planted more lavender this year and it is mixed with the heady fragrance of old roses. However, it is sooooooooo hot (103*) and humid here that we don't go out on the patio very often in the afternoon or even evening. You need to explain to me how you did the lavender wands. I seem to remember a blog post about it so I probably could research your posts. Loved this post Martha, it brought back a lot of memories. I love to hang my linens outside to dry. Like Kate said, there really "isn't anything better than scooting down between" sun dried sheets. I actually hang as many clothes outside as I can. I just love the fresh clean smell. I remember helping my grandmothers hang their laundry outside and when it came time to take them down I would take a big sniff of each item before I placed it in the wicker laundry baskets. If I could have a clothesline, I most certainly could. We have restrictions in our neighborhood. I grew up helping my mom hang clothes out on the line. They smelled so clean and fresh when brought into the house! It was tough during the winter, though. I sometimes had to bring in frozen t-shirts and towels. LOL Oh, but that smell- nothing like it! Ah~h~h... there's NOTHING that can compare to the smell of linens on the line! Thanks for the memory. By golly fresh air beats air freshners by a long shot. Great post. I prefer to hany my sheets outdoors. It saves to hang the clothes out. In most neighborhoods now there are restrictions on hanging out laundry, which I think is silly, glad mine is not one of them. Betsy - I agree that it's silly to have restrictions about hanging clothes outside -- I can see restrictions on clothesline POLES but there are so many retractable options so that there are no unsightly POLES. I, too, am glad that our community has no such restrictions! i used to love hanging sheets outside but it seems the pollution or the birds made me end up washing them all over again. What a nuisance! I agree - I missed a clothes line - had one for years and the smell is terrific. The first thing I wanted at Pondside was a nice long clothes line and The Great Dane put one up for me. Like you, I go into raptures over the pleasure of wind and sun-dried sheets. The biggest treat for me is fresh linen on the bed when I come home from a trip. Thanks for bringing back the memory of walking and hiding between the sheets hanging outside. It was magic. I want a clothes line! It's just a trick to figure out where to put it. I'd like to have a retractable one, but I'd still have to put a post someplace. My best friend has an umbrella one, with a removable post, but I'm not sure the arms are long enough to dry sheets on that one, and that is one of the main reasons I want it.